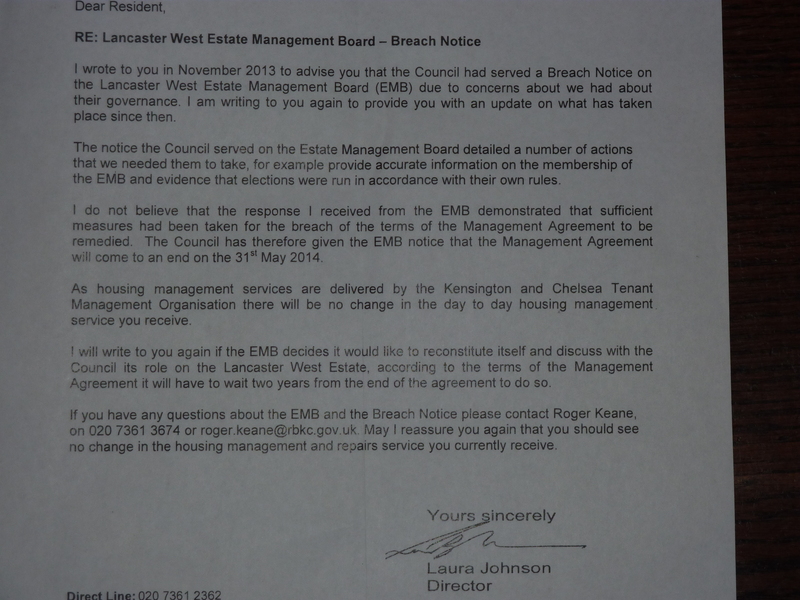 The above letter and the publication of the “Breach Notice” contained within was sent by the Director of Housing for the Royal Borough of Kensington and Chelsea and signals the final death knell for the Lancaster West Estate Management Board (EMB). It is a well known fact that the RBKC Council and the TMO have wanted to dissolve the EMB for many years now and, in doing so, gain total control of Lancaster West and how services are delivered to it’s residents. The pathetic level of representation experienced by Lancaster West residents is now set to worsen even further. With the demise of the EMB and with the Lancaster West Residents Association in a state of disrepair the residents of our community find themselves voiceless. A consequence of this “voicelessness” is that the RBKC and the TMO will do exactly as they see fit to our Estate and any hope of proper investment in our homes will become even harder to achieve. The Grenfell Action Group believe that the RBKC Council acted in an immoral way and took a course of action that they knew would lead to the EMB Board failing. We had previously asked for the RBKC to help support the EMB through their recent difficulties but instead of offering assistance the RBKC chose to use this opportunity to kill off the EMB. It may be worth reflecting that prior to being served with the final Breach Notice the state of the EMB was not all of their own making and the reasons behind the failure of the current Board could be closely linked to the way Board members have been treated by both the Council and TMO who have, historically, made it their business to disempower the EMB. We believe that the the Council knew full well that the existing Board Members of the EMB would not have had the ability to follow the Lancaster West Management Agreement’s constitution and could not get it together to hold a successful postal election ballot. With this in mind, we wrote to Laura Johnson in October 2013 asking for assistance for the EMB to help guide them through their current difficulties and help them complete the election ballot and find ways of strengthening their representation in the future. Instead of providing this assistance the Council chose to set the EMB up to fail by setting them a task that the RBKC Council knew full well would never be achieved. Residents will want to know how the interests of the Lancaster West community will be represented in the future and how we can have a meaningful influence on the long-term security of our homes? In the meantime, the RBKC Council and the TMO’s plan to disempower our community, prior to the “social cleansing” of Lancaster West Estate, continues unabated.